Mangaluru, Mar 25, 2019: Justice K S Hegde Charitable Hospital, Deralakatte under Nitte (Deemed to be University) has added four new state-of-the-art health care facilities for the benefit of the patients, which were inaugurated on March 24, Sunday. The new facilities are the new advanced paediatric intensive care unit, the neonatal care unit, burns care unit and Prof M Shantharam Shetty tissue bank. These facilities were inaugurated by Dr B N Gangadhar, Director, Nimhans, Bengaluru. Speaking on the occasion, he stated that the newly inaugurated tissue bank was the only centre outside Bengaluru in Karnataka. Doctors need not procure tissue material from Mumbai and Bengaluru as it will be available here in the tissue bank. He emphasised the need for inculcating empathetic values and better communication skills during training of medical graduates. Doctors should be open to learn from other systems of medicines and do their best in the interests of the patient. 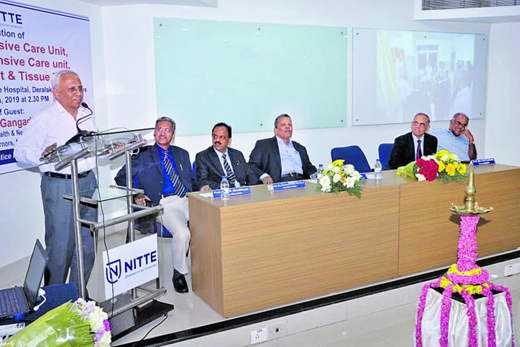 Nitte (Deemed to be University) Pro Chancellor Prof M Shantharam Shetty explained the use of the facilities. He thanked the Canara Orthopaedic Society and Canara Orthopedic Surgeon Trust for joining hands with K S Hegde Hospital and coming forward to donate Rs 10 lakh for establishing the tissue bank. Vice Chancellor Dr Satheesh Kumur Bhandary appealed to Dr Gangadhar to consider a few changes in the rules and regulations of Medical Council of India in improving medical teaching in India. The office-bearers of Canara Orthopaedic Society handed over a cheque of Rs 10 lakh to K S Hegde Charitable Hospital for establishing the tissue bank. Chancellor N Vinay Hegde attended amidst a large gathering.